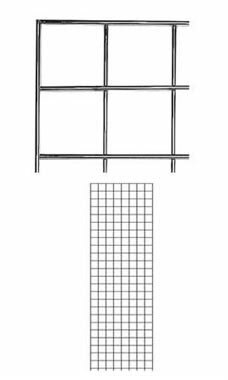 Maximize the space that you have available on your walls with this Gridwall Panel. This panel measures 2' x 6', which makes it great for any size items and accessories. The chrome finish looks great in any setting that you wish to put it in, and will be a great addition to your showroom! Grid Panels feature sturdy wires spaced 3" on center with double wires along each side of the panel. All items are in stock and available for immediate shipment. Grid Wall Panels arrived super fast and packed carefully! The shiny chrome provided the ideal backdrop to display my Wearable Art Silks. I get all my display and packaging items from you. Thank you! Perfection to the max! outstanding quality, very strong. Very fast shipping and well packed.